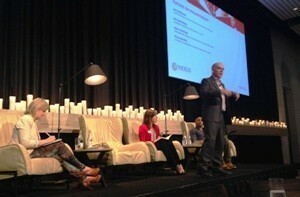 Australian social entrepreneurs need to be more flexible and take more risk in the world of philanthropy, the Nexus Australian Youth Summit in Sydney has been told. Paul Higgins (Emergent Futures) at the Nexus Australian Youth Summit. In a panel session on the future of philanthropy, Paul Higgins, Futurist and Uncertainty Navigator at Emergent Futures, Dr Sam Prince, the founder of One Disease at a Time and Zambrero, along with Holly Ransom, the Foundation for Young Australians WA Partnerships Manager, agreed that social entrepreneurs need to be more comfortable with uncertainty. The trio also discussed the shift towards more collaboration between organisations and predictions of a move towards sector leaders becoming “serial entrepreneurs” and “serial innovators”. "The future is already here, it's just unevenly distributed," Higgins told the audience, who suggested that the sector needed to “take more risks” and “fail more” in order to find success. He also told the audience not to forget “the old fogies in the room”, who have the experience and skills to help. "If you are looking for ideas for what might change, looking broadly across other sectors and other industries is just one way we look to get new ideas," he said. Dr Prince also shared advice that a “really strong entrepreneur” had once told him that “entrepreneurship is to be comfortable with uncertainty”. He told the crowd that the "knee jerk reaction to emergency was to regulate, regulate, regulate", whether it be areas such as health or education. "This is the issue that after a little while you have mitigated these tragedies but in its place you have installed mediocracy," he said. "Now we're moving towards a place where we’re trying to mitigate the risk at all points and kind of regulate at the lowest common denominator." Holly Ransom moved the conversation towards leadership and spoke of a real need for a different kind of leadership in the philanthropy. "One of the things that is interesting moving forward is the need for that appetite for high-risk philanthropy," she said. "I really think we need philanthropy to be the risk capital for social change. We're starting to see the change to social impact bonds and this need for experimentation. "I've been involved in a lot of long-serving institutions over the last couple of years and it's quite interesting to see the way that we judge success on perhaps the number of years our organisation has been around. "I think that what we are going to start judging organisations on is the ability for our impact to live on, so I think that we'll start seeing different models of collaborating and organisations coming together and affectively joint venture partnerships to achieve social impact. "I think we'll start seeing more leaders who will start up a social enterprise, that will start up an initiative to run something to achieve the impact, to close it off and move on. So we'll almost be serial entrepreneurs but will also have serial innovators." The Nexus movement, which was started at the United Nations in New York three years ago, attracted about 200 people to the event, hosted by the Foundation for Young Australians and, featured a long list of big names including Nexus Global Youth Summit Co-Founder and Curator Rachel Cohen-Gerrol, LeapFrog Founder Andy Kuper and G(irls)20 President and CEO Farah Mohamed.